Values | If Not Now, When? Just as a house is built with 2 by 4’s, you too have an infrastructure to your life. Your infrastructure is built on your core values. 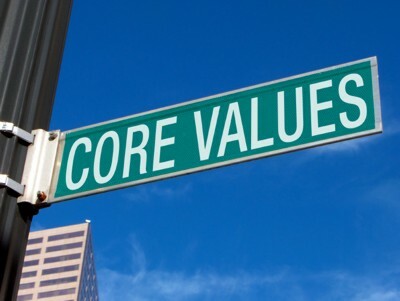 Everyone has core values, very few have identified exactly what they are. Core values guide our choices, help us know when we are making decisions that aren’t in alignment with our values and our true north. Once you have identified what your core values are, you can look at common threads that have run throughout your life and see how they guided you, protected you, helped you succeed and grow. Knowing what they are is a life affirming action that will show you that you are taking care of yourself and trusting yourself. So how do you identify what they are? I have a very easy, five minute exercise that will help you figure it out. We should all have three core values. In this exercise, you will dowload this document that is just a list of many different core values. I’ve listed the most common core values, and some that are not so common. Once you have the list, I want you to spend a few minutes and circle the twelve (12) most important values to you. After you have done that, cross off three (3)…I know, not so easy but you can do it. Now, cross off three more, you can do it! Now cross off your final three and what you will be left with are your three most important core values. Core values can change as we grow, mature and have different priorities in our lives. Maybe in your twenties family was not a core value and now in your 30’s it is. It’s ok for your core values to change as you age. Now that you know what your core values are, you can use them as guideposts, as a gauge for those big life changing decisions you may be faced with, to help you know if what you value most in life will be well served by one choice or another. Figuring out your core values, as you have learned, is not a complicated thing at all…take the list, share it with family and friends, it will be an easy way to get to know those in your life better!